The Android device works out of the box when it comes to performance, features, customization, and personalization. However, they become frustratingly slow and sluggish after a while. No matter how laser-focused you’re towards your data, you always end up losing your valuable storage space. Well, the culprit is junk files that are stuffed with useless cookies and cache files. It is strongly recommended to eliminate junk files because they are not just useless but also affects your phone’s performance. Moreover, eradicating these junk files can boost your device performance and give you an organized device. Today we’re going to discuss how to delete junk files on Android with Systweak Android Cleaner. What Is “Systweak Android Cleaner”? It is an ultimate yet influential tool that helps you to declutter your device with ease. Easily optimize and enhance your device functioning. After using Systweak Android Cleaner, repeatedly frozen screen, phone lags and battery drainage problems will be a thing of past. Android performance is quite impressive when it’s new. But you can enhance your phone’s performance if it’s slow on the uptake. Clean cookies and cache or schedule cleaning of your device with Systweak Android Cleaner for speedy and lag-free smartphone. 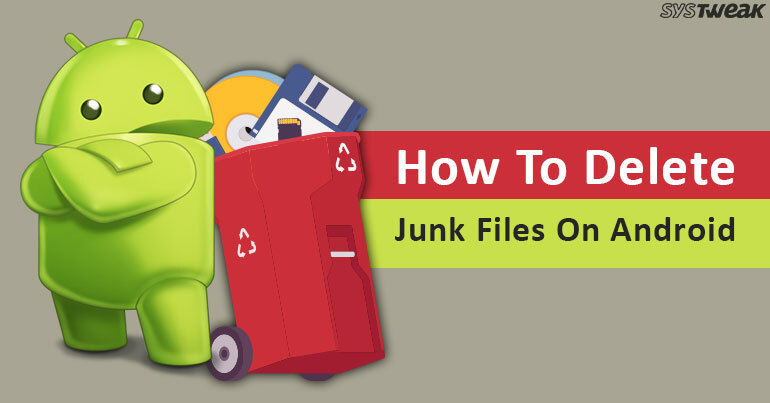 Your phone is filled up with the good number of redundant files and junk files, which you don’t need to keep it. Furthermore, it not only takes up loads of storage space that impact the speed of your smartphone. Using Systweak Android Cleaner will give you brief information about the occupied storage and help you to clear and free up junk files, unwanted temporary files and replica files. Duplicate files and pictures eat up precious space on the storage drive. Luckily, you can avoid space hogging duplicates by cleaning replica files using Systweak Android Cleaner. It thoroughly scans your phone and shows the duplicate files in an organized way. You can auto-mark duplicate instead of deleting them manually. It is a great way to clear your unnecessary junk to stay organized. Battery of your phone is an essential part of your device. Moreover, it is annoying when you need to charge it again and again. Moreover, the device battery drains than usual after a while. However, you can use ‘Battery Saver’ that will do the needful for you. This best Android cleaning app reduces the consumption of most used areas which drains your battery to the extreme. It is frustrating when your phone is responding slowly to your commands especially when you’re playing the game. Sometimes it’s slow because it runs multiple programs together. However, Game Booster cleans up your RAM and wanted resources which are required to get effortless and swift rejoinder. Generally, Android device can be slow due to less storage space and also when you have multiple files running in the background. It is a prerequisite to eliminate a few unwanted files such as junk files, cookies, and cache so that you can enhance the speed of your device. Newsletter: Twitter Gets Crazy With Characters & Has iPhone 8 Failed?